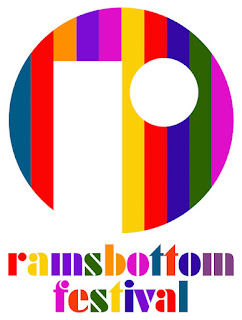 I am making many sacrifices to the rain gods in hope that the sun will shine down upon our soggy Pennine Valley over the weekend of September 14-16, when the Ramsbottom Festival comes to town. Last year's festival was many things, but dry was not one of them. It was, however, all of these things: fun, well-run, immensely entertaining, child-friendly, adult-friendly and (in a humble, Rammy-appropriate way) totally rocking. You can read my review here. You can't really do anything about the weather, but there is much more preparation happening at the Ramsbottom Cricket Club site to prevent mud and/or flooding in the event of serious rain. They've done more to make the festival truly family friendly: There's going to be a ladybird tent with children's entertainments, and the funfair rides will be free. The festival ale will be brewed within shouting distance at Rammy's own Irwell Works Brewery, whose wares I was able to sample the other day and I'm not at all worried about the quality of the beer. Camping has moved to St. Andrews Primary School, a short walk away. (Updated: I heard residents' complaints have put the kibosh on this campsite, but sure the festival folks have cooked something else up for campers.) And I understand they're laying on coaches to transport folks to and from Chorlton and the city centre each day of the festival. Not as atmospheric as arriving by steam train on the East Lancs Railway, perhaps, but surely very handy for some. Sometime in early 2004 I went to my very first Manchester gig knowing literally nothing about the band, the venue, or the city. I just thought the band's name sounded interesting. It turned out to be I am Kloot at The Night and Day. (Yes, I accidentally went to the most Manchesterest gig ever.) They put on a great show and I instantly became a fan of this fine band, fronted by the raspy-voiced songwriter Johnny Bramwell, joining an army of other Mancunians who make up their loyal following. Why they haven't gotten really big like their contemporaries Elbow and Doves is a complete mystery to me. Seth Lakeman is a traditional fiddler and singer-songwriter who was nominated for the Mercury Prize a while back. This song is about a servant girl who killed herself on Dartmoor and is said to haunt the place. Intense. Liz Green has become a firm favourite in the Manchester area and is developing a growing audience around the country. A bluesy folksinger whose voice sounds a lot like Billie Holliday to me, doing her own thing musically and sounding great at it. There are plenty of other acts on. Some performers my friends are excited about include: Roddy Woomble (of Idlewild fame), The Inspiral Carpets (sorry, I kind of missed that whole Madchester thing) Air Cav and Admiral Fallow. And there's plenty more fun to be had in the silent disco, which proved the sleeper hit of last year. But as entertaining as the silent disco was, it couldn't compare to the sheer joy of watching this guy dance. 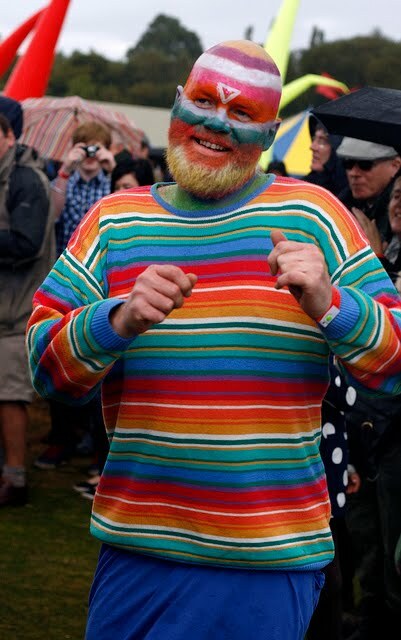 Like a Lancashire Bacchus, Stripeyman embodied the true spirit of the festival. I'll be looking out for him. 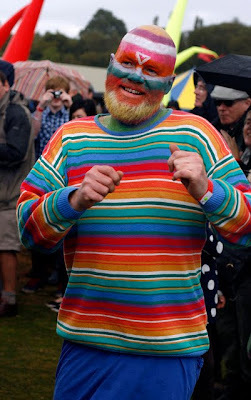 Stripeyman photo by Brian Connor.